It seems like the vast majority of us don’t get enough sleep at night. And a lack of sleep means a very difficult time getting out of bed in the morning. 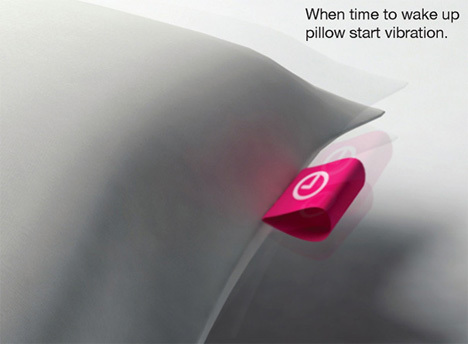 If you find yourself hitting turning the alarm clock off in a sleepy haze and then ending up dismally late for work a little too often, the Alarm Clock Pillow concept from Seung Jun Jeong is just the thing to get you up and going. 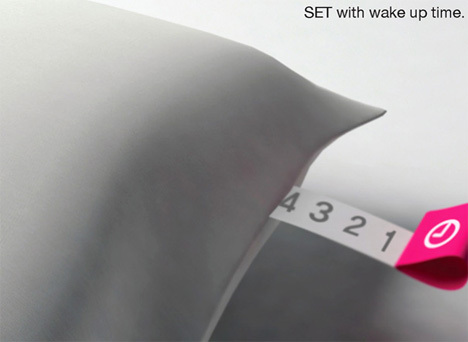 Rather than a noisy alarm clock that jars you awake, the Alarm Clock Pillow gently vibrates to shake you from your slumber. If you don’t get up, the pillow will know – because it can sense the weight of your lazy head on it. It will keep shaking until you get out of bed to face the day. You set the alarm by pulling the bright tab on the edge out to the appropriate number of hours. From a quick nap to a full eight or nine hours of shut-eye, this pillow seems able to accommodate just about every sleeping schedule. The design looks like it could use a bit of refining, beginning with the mechanism to set the clock. 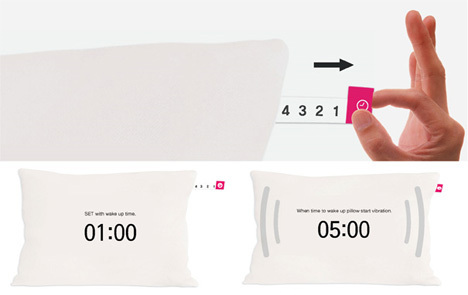 Not everyone wants to sleep in full hour increments, and it looks like it would be difficult to be precise with the pull tab. 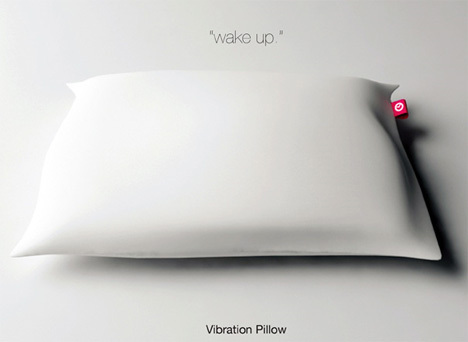 It would be great if the vibration got increasingly strong the longer the sleeper stayed in bed. But the overall idea seems like a fabulous concept, and one that any notorious over-sleeper would be inclined to try out. See more in Clocks & Watches or under Gadgets. November, 2010.